I’ve long imagined the notion of a ‘storefront’, or a safe space, where those who are too often relegated to the fringes, could, quite literally, drop in and find the ready opportunity to create. And, once engaged, and while connecting with others, gaining a real sense of belonging and empowerment. In today’s society, usual ‘ways of doing’, in the social service realm, have come to mean, a top down/power-over support role, with the system naming ‘professionals as managers’ and as experts on other people’s lives. At the same time, and as the literature would suggest, the development of individual identity and learning has been hampered by the valorization of knowledge and skill acquisition, in a flattened landscape of work or play. In effect creating environments where options and resources for self-discovery are limited or manufactured, and, in my opinion, quite stagnant—and most particularly, again, for those on the margins. As a studio artist, social worker and counselor steeped in relational-cultural therapy, I’ve been extremely excited and privileged to support the ‘social nature’ of learning and increased self-efficacy—within a range of individual and group support environments. I’ve also been particularly struck by the gap in transition-age supports; where both younger and older adults, across their life course, are lost in a place where there are few progressive and sophisticated opportunities to express genuine personal agency. The most thrilling aha! moments and occasions of unexpected self-discovery and real agency, as I have observed, can occur during immediations and interactions where individuals are able to focus autonomously and to direct, their own compelling and creative projects, and all within a shared and safe third space---a place that is neither at home or at work. This is an organic and spontaneous process, where moments of co-presencing or ‘joint connection’, (to use a more psychological term), arise out of this shared doing of something interesting, and where all parties give themselves over to making it happen. They do this because they feel it is worthwhile, (and maybe fun! ), and without the imposition of a stressful, unattainable/unsustainable, and engineered effort to maintain their attention. Individuals themselves are selecting their experience of choice; managing the outcome and establishing a tempo that suits their own intuitions. A relational approach would also describe this process as a matter of testimony and witness, where, through connection and a shared narrative or collective interaction, individuals co-experience an increased sense of worth, individual agency, belonging, and a certain ‘zest’ for living. At the same time, a relational framework will enable theSpace to introduce not only innovative, person-directed projects, (as opposed to programs), as well as cutting-edge technologies and workshops, but it will serve as a model of engagement which has many untold applications for the larger community, as well! As a hub or incubator of sorts, theSpace will invite involvement from a range of community partners; it will provide training opportunities for facilitators and schools; support sustainable and multi-application learning, co-composition and story-making, skills and identity enhancement; social enterprise opportunities; remote and onsite activities; business and corporate sponsorships; co-working and playing space; artist in residencies; and academic participatory/action-oriented research. Last, but certainly not least, theSpace will help create a range of friendship and peer to peer networks which will help individuals to familiarize, and connect with, future roommates---bringing full circle the notion of belonging and community! There is no easy answer to this question, but there are some key elements that must be part of our children’s future, if they are to find a place in the world and flourish as they can. Of prime importance is a context of community, and the need for a creative drive that motivates curiosity and learning. Community provides us with support, belonging, care, engagement, and place to contribute value-- all helping us to create an identity that can grow. In the world of accelerating change, learning is vital all of us. Finding and developing our creative curiosity, gives us all the internal drive to continue the pursuit of learning. When my daughter was young she loved to watch anime, and I encouraged her to write little stories of her favorite characters, or fan-fiction. I really never thought she would learn to read and write. But she began to love her stories. Now she writes every day, considers herself a writer and writes forty-page ‘chapters’ of an ongoing story. Her love of writing has led her to overcome huge difficulties in learning. The next challenge for my daughter is enabling her to find a social space for meeting, socializing, creating, contributing. A place where she can create with others and continue a learning journey. I am excited to have something like theSpace in Ottawa, where individuals can stop by to check in with new friends, join a class/workshop and feel independent--- all within a safe, neutral environment. Having worked for many years in the community supporting young adults with Autism Intellectual disabilities, I am well aware of the huge benefit of having a forum or a place outside of home and work, where you're able to be yourself, explore creative activities and have fun with others. Being central, accessible and having room for a wide range of activities, will allow for many individuals to enrich their lived experience and share authentic connections with others. Personally, I look forward to offering exciting and unique ways to use technology and the endless creativity that comes from working in smaller group projects! As a drop-in space, theSpace answers some very pressing needs faced by Ottawa's disability communities, which range from issues of extreme poverty to issues of violence, isolation and social devaluation. We have already seen the transformational effects of community-hub initiatives in other cities, and the arrival of these ideas to Ottawa is long overdue. In light of growing recognition of the importance of fostering community-based approaches to intellectual disability, it is urgent that we facilitate safe spaces like theSpace where people labelled with intellectual disabilities can draw upon peer support to pursue art-based practices, educational opportunities, social enterprises, and much much more. The high levels of poverty in disability communities makes the co-operative model a powerful solution to overcoming these barriers and enhancing social capital, and this will allow theSpace to remain responsive and highly relevant to community needs in the years ahead. theSpace will fill an important gap in Ottawa as a place where people of all capacities and abilities can meet to learn, share and create as equals. As a doctoral candidate and videographer who works collaboratively with people with disabilities to tell experience-based stories and sibling, I see theSpace as a hub where I could engage with disabled people to build our collective capacity to conduct participatory community-based research projects using arts-based methods. We need an independent environment where people's capacity to create and to think critically is recognized and encouraged. Community-based research led by and enacted by people with disabilities, will produce and share knowledge in a variety formats/modes that will benefit many people currently living at the margins of the Ottawa community. theSpace will play an important role in developing this work. 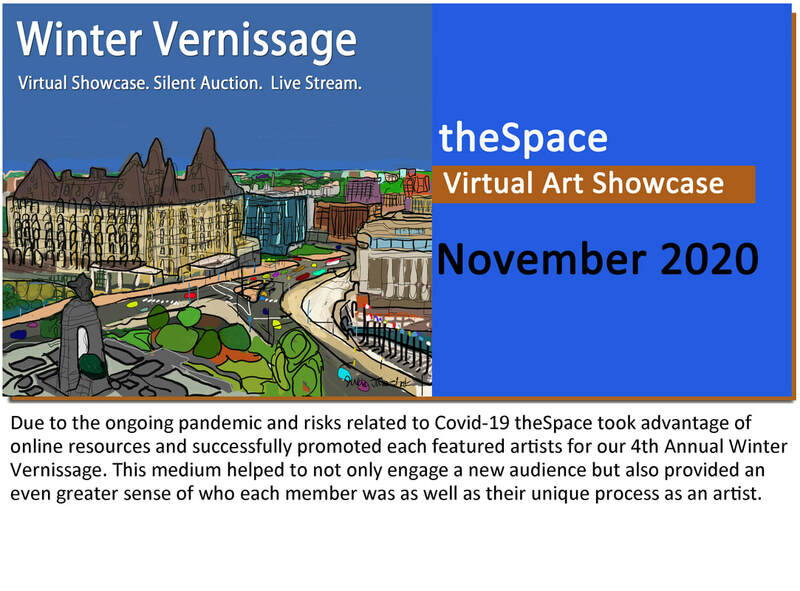 theSpace is a unique and innovative solution to a critical issue which is fast becoming an emergency in Ottawa and Ontario, and the whole country. Bureaucracies are there for the purposes of administration and management; there has been a terrible lack of leadership in the areas of housing, socialization and long-term quality of life, to the point where the problems have become systemic and out of control. I have spent the last 28 years acting in various volunteer capacities in the not-for-profit community, with a focus on creating better opportunities for people with intellectual challenges. I am co-founder of the Down Syndrome Association – National Capital Region; past board member of the Canadian Down Syndrome Society; past President of the Down Syndrome Association of Ontario; key player in creating H’Art of Ottawa; founding member of Families Matter Co-operative; and various other related activities. I have always focused on the quality of life, “when we are gone”, and the need to ensure that our loved ones are safe, secure and happy. I have also always believed that it is the families and individuals with intellectual challenges that will create opportunities to realize their potential and reach their goals. theSpace is the culmination of years of networking, communication, sharing of ideas and not giving up. It is the best chance we have to achieve our goals, avoid more potential disasters, save tax dollars and move forward. THE SPACE is the best bang for your buck and deserves all the support it can get.